BK's Chardonnay Motor Lodge is Masterton's newest motor lodge and offers the latest in affordable, quality accommodation just minutes from Masterton's town centre. Whether on business, leisure or on a special occasion BK's Chardonnay Motor Lodge offers affordable, luxurious accommodation. 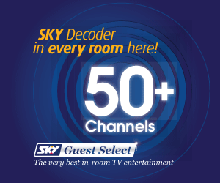 Enjoy Free WiFi and Sky Guest Select 50+ Channels.